Friday was the start of Shimelle's Online Scrapbooking weekend. She is hosting several challenges and discussions over at her blog. Please be sure to check it out! You're guaranteed to have some great fun. I turned it into a 8.5x11 due to the size of the tiny picture booth photos. I didn't want them getting lost on a 12x12 layout. The photos are of my brother and I (when we were younger). I think I was about 16 or 17 in these photos and my little brother was about 7 (he is now 13). 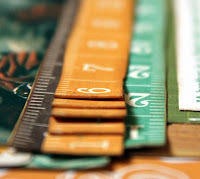 The green grid paper, the papers layered behind the photos, the measuring tape borders, and a few of the embellishments are from Echo Park's This and That Charming collection. I wish I could tell you where the numbered paper is from but it seems I threw away the bitty strip! If you have an idea of where it's from - please let me know. The cloud embellishment (that I cut in half) is from Simple Stories' Fabulous collection. The tiny little hearts are from American Craft's Dear Lizzy collection. The wooden buttons are also by American Crafts. The camera that is in the middle of the title was fussy cut from a paper from Echo Park's playground collection.. The title it's self is made up of alpha stickers from My Little Shoebox (Lovely Day). I wanted to add butterflies to the layout but I didn't want them to be 'girly' because this is a layout about my brother after all. I decided to use the negative from my Martha Stewart 3 in 1 butterfly punch. I think it added the perfect touch of butterflies while still saying 'manly'. I also did some faux stitching with a white gel pen. "A brother is a friend who was once a bother." My brother has always annoyed me. He is never serious and always joking, completely spoiled, and is always rough housing around. I'm certain he will annoy me well in the future...even when he is a grown man. Who can blame him, though? A little brothers job is, after all, to annoy his big sister. I love my brother. Always have, always will. It is my true belief that I have him to thank for my being a good mother. As a toddler, he taught me a thing or two about dirty diapers and bad 'boo boos'. As a younger child, he taught me a thing or two about imagination and compassion. ...And now as a teenager, he has taught me a thing or two about patients. All of the key lessons of motherhood. My little brother is a good person. Smart, funny and caring. ...No matter how annoying he gets! You'll see plenty more projects from me over this weekend/week as I play along with Shimelle! Why don't you come join us? Great layout! I love how you ruffled the tape measures! This turned out awesome Christina! I love the ruffles on a masculine layout! Cute layout! Very creative use of embellishments! Looks terrific, I like your mix of papers. I really like this! I love your groupings of embellishments!